The cleaning nozzles are available in a variable-speed version. The integrated speed control of the cleaning nozzles ensures a uniform, pressure-independent speed of approx. 600 min-1 and therefore a consistently good cleaning result. The mounting of the Surface Cleaner is straightforward due to the bores integrated in the holder and the body. The unit is available from a length of 450 mm (2 cleaning nozzles and 2 holders) and up to a length of 1950 mm (10 cleaning nozzles and 4 holders). The lengths and versions of the Surface Cleaner are customized as required. On request, the Surface Cleaner with its variable-speed cleaning nozzles is also available in a version for areas with a potentially explosive atmosphere. Processing associated with the surface treatment of paper, leather and plastic parts and on laminating and coating machines can also be optimised using these units. 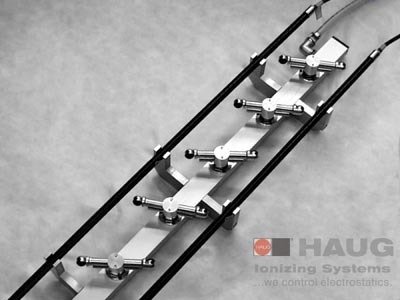 with speed-variable cleaning nozzles, for two round ionizing bars.